The Tibetan Scrolls hidden somewhere in the Hemis Monastery of Ladakh may hold the key to the myth of Jesus in Kashmir! Pure Aryans or the remnants of Alexander’s army or according to Michel Peissel, the residents of a Stone Age museum! 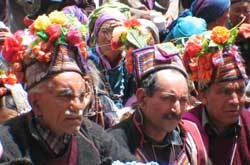 Pure Aryans or the remnants of Alexander’s army, this strange tribe known as Drokhpas, are the inhabitants of Batalik area of Kargil in Ladakh. Inspite of stark beauty of landscape, people of Ladakh are a vibrant & colorful lot.